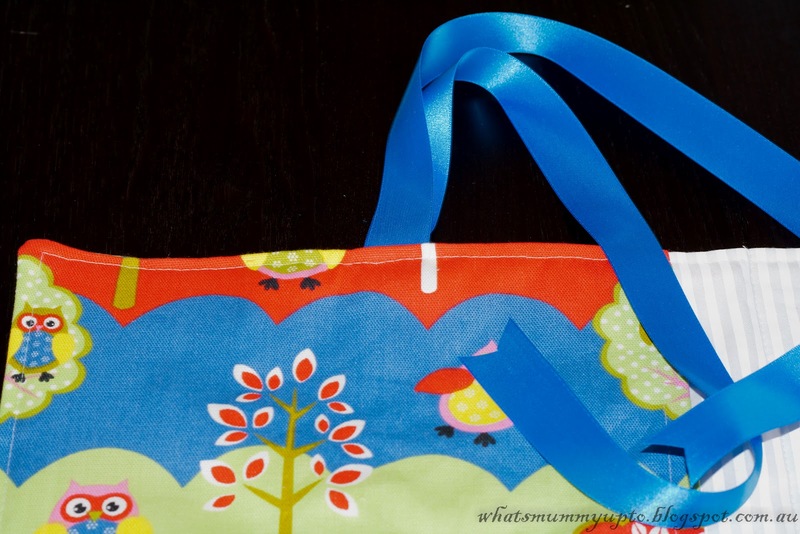 Seriously, how much stuff do Mums carry around with us for our bubs? And if you're anything like me, it's almost impossible to find things easily in the baby bag, especially when there's a little bit of a rear-end emergency, and a quick change is required ...the baby's rear end that is...not mine!! 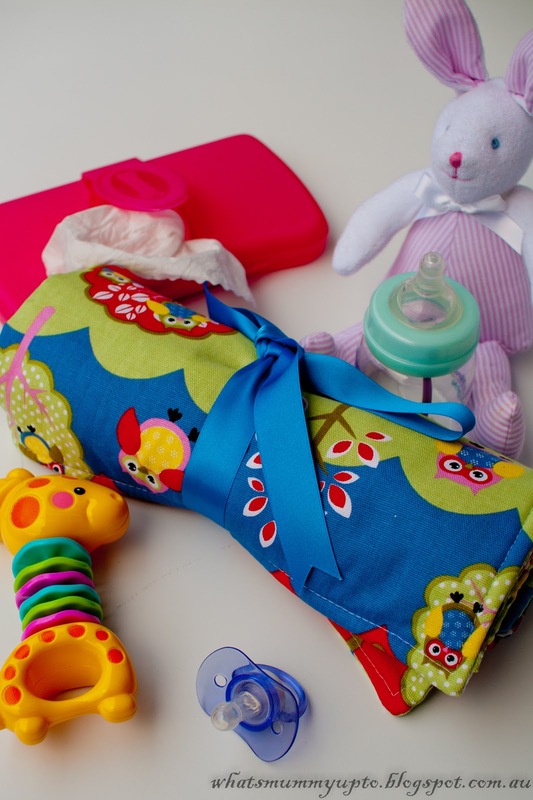 So when I fell pregnant with Hannah, I decided to design a change mat / nappy (diaper) roll to keep everything together so that at change time you just grab this roll, and everything is there. There's also a nice warm, clean, germ-free place for baby's little bottom to lay on, and the whole thing is machine-washable, so if there are any accidents with those inevitable "explosions", it's super easy to clean. 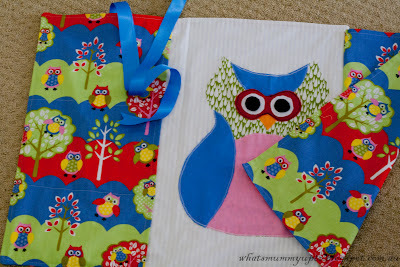 I first designed and made this when my brother had his second baby, which was just 6 months before Hannah was born. 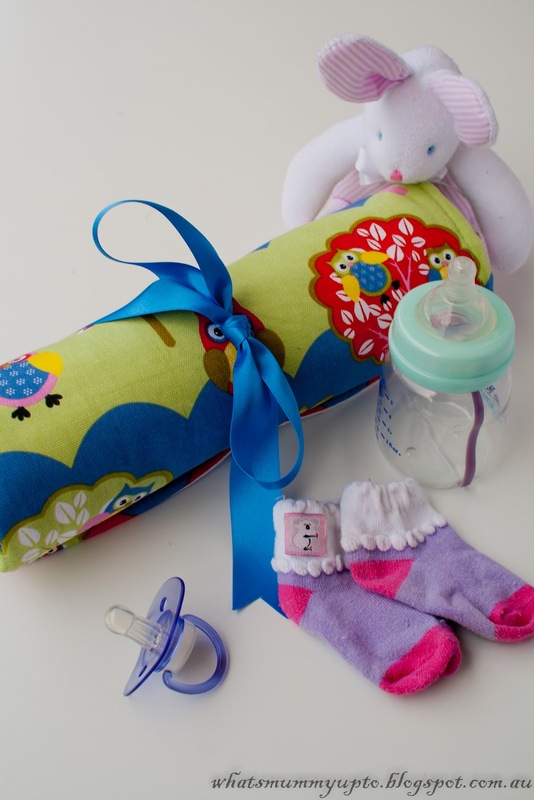 I was toying with this idea in preparation for Hannah, and thought I'd try it out as a hand-made baby gift. I then tweaked it a bit and made one (in pink floral) for me after Hannah was born. But this third attempt is by far my favourite. This is for a friend who's having twins, (!!! I am absolutely in awe of anyone who stays sane with 2 or more babies at once!!) so I made the pockets a little larger (to carry 2 of everything), and used fleece to line it instead of batting so that the whole thing is a little thinner, and will therefore take up less room in that baby bag or the basket under the pram. 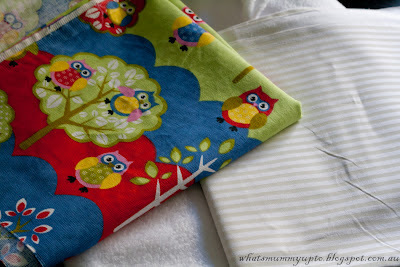 Also, my friend doesn't know if her bubs are boys or girls or one of each, so I had so much fun choosing a fabric suitable for both, and in a cute owl print, 'cause she loves owls! This is a great project, and can be done in just a couple of hours (perfect for Hannah's nap time while Bethany was at pre-school), so I thought I'd share it! If you make it, please let me know and post a pic so I can see!! Also ... I'd love for you to share around this pattern and even sell what you make, but please give credit back to me for the pattern / tutorial ... thanks!! 1. Lay the main fabric rectangle (24x21 inch) right side down, then lay the fleece directly on top. Pin around the edges and sew about 3mm from the edge all the way round to join these two together. I find that the fleece stretches a little as you sew it, and I had to trim some frilly bits of fleece off around the edges after I had finished sewing. 2. Grab 2 of the smaller main fabric rectangles (11.5 x 20.5 inch) and sew right sides together across the top short edge, down one side, and across the bottom short edge. Leave the other long side open. Turn through so the right sides are out, and iron flat. (Try to get the corners really sharp, because it really does look and sit much nicer that way. I use my scissors to push into the corners from the inside.) Then topstitch around the same 3 sides, approximately 1/4 inch from the edge. This is the flap that opens out to make a larger change area for bub's little tooshie. 3. Grab the 3rd smaller rectangle (11.5 x 20.5 inches), and lay flat on the table right side up. On the right hand long side, turn a double hem about 1/2 inch wide, and sew. This is the pocket piece. 4. 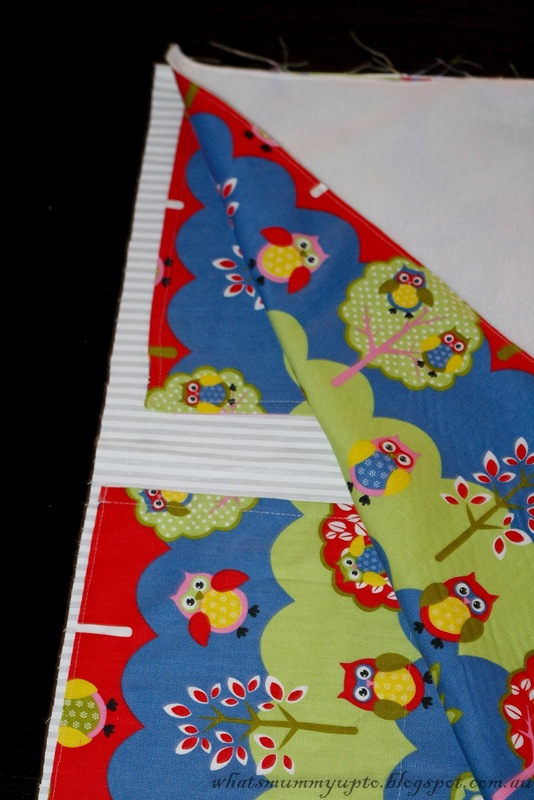 Lay your lining fabric (24 x 21 inch rectangle) flat on the table right side up. Take the flap we made in no 2 above, and pin the open edge to the right 21 inch edge. As this has been hemmed, and to leave space for hems around the edge at the end, the flap is now shorter than the 21 inch side, so just centre it to the side as best you can. 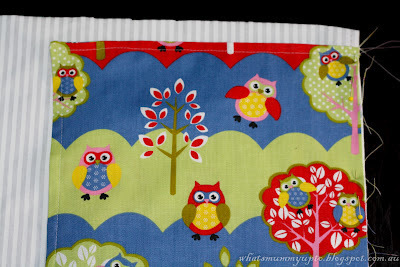 Sew down using a 1/4 inch seam. Don't worry about all the raw edges. I promise they'll magically disappear later!! 5. 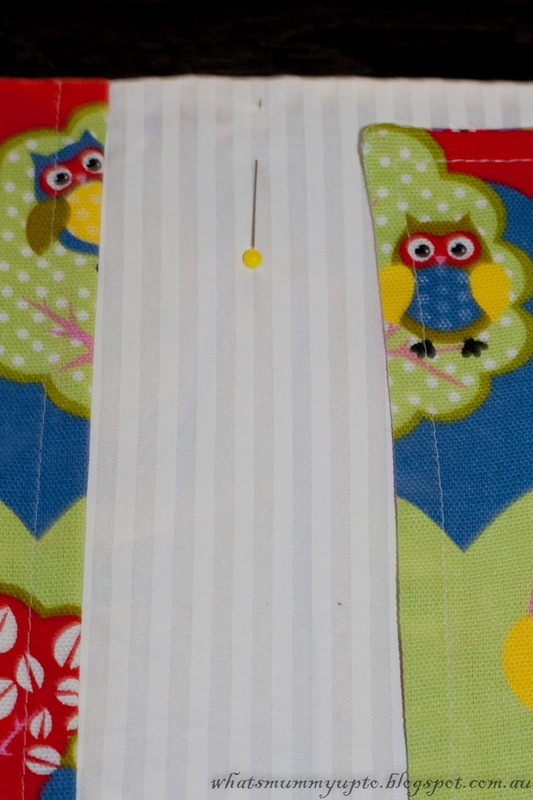 Lay your lining (with the flap now attached) flat on the table right side up, and pin the non-hemmed side of the pocket piece to the lining opposite the flap side. 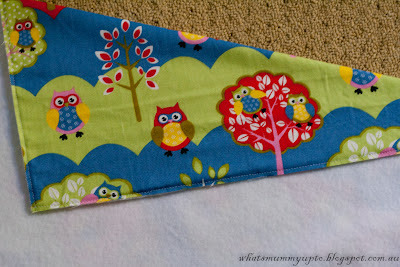 Sew this in place using a 1/4 inch seam. 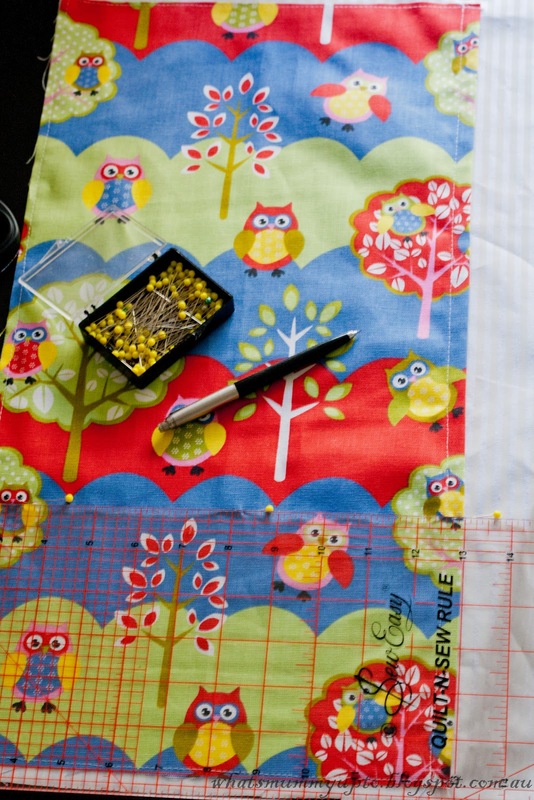 Then lay the lining fabric down again, and mark using a ruler and pencil/pins where you would like the pockets to be. 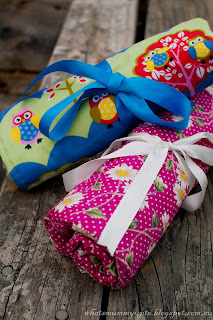 In this one I did 3 pockets, with the bottom two being smaller (for things like wipes) and the top one being much larger so that it could even hold a change of clothes (or 2), but you could make them as big or small as you like. 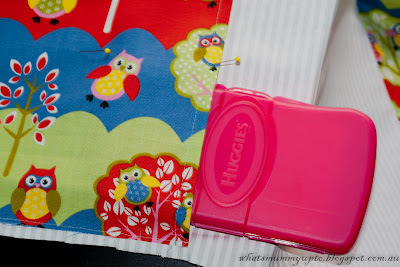 Then sew from the edge of the lining piece across the pocket to divide this big pocket piece into your smaller segments. 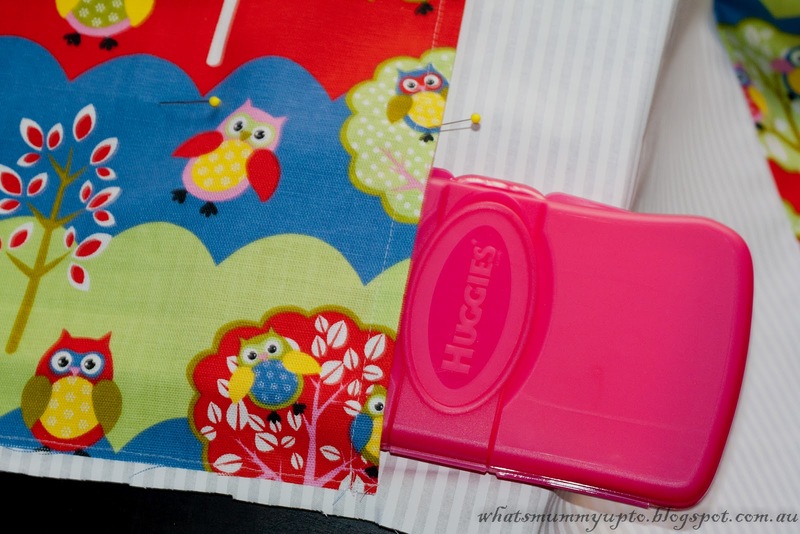 It's a good idea to use your backstitch at the hemmed side of your pocket piece to give the pockets a little extra strength. 6. Now lay your lining piece right side up, flat on the table with the flap folded in. Place the main fabric backing (which is joined to the fleece) on top of the lining, right side down. Pin securely all around the edge, leaving a gap of about 6 inches at the top corner, above the pockets. Sew around this (making sure you remember to leave the gap ... yep I had some unpicking to do! ), using a 1/4 inch seam. 7. Trim off the corners (which makes it sit flatter), then turn the whole thing through so it's right-side-out. 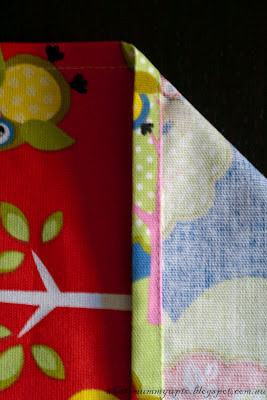 Use your scissor to push into each of the corners to get a beautiful square corner. Now flatten it all down as best you can, then iron the heck out of it. Take your time with this, and try to really give it a good press, as this will help it look so much neater and more professional when it's finished. 8. Fold the change mat in half, and mark the mid point, then open again with the lining side up, and sew a straight line right down this mid-point. I find this helps it to fold easier and flatter, especially when you're in a hurry, or trying to do it with one hand while holding the baby with the other! What do they say about Mums and multi-tasking!! 9. Now measure (in the gap that you left at the top), halfway between the edge of the change-mat and the mid point (that you just sewed). This is where your ribbon tie needs to go. Fold the ribbon in half, and insert the folded end into the gap you left for turning in No 6 above. Pin it in place, and pin the gap closed, trying to get it to match the 1/4 inch seam you used before. 10. Topstitch around the entire change-mat, 1/4 inch from the edge including the gap (this automatically attaches the ribbon and sews the gap closed without needing any tricky hand-stitching). Now, being me, I had to try and make this one a little trickier, and given my new-found obsession with applique (see here), I thought it might fun to extend the owl theme by appliqueing an owl motif inside the change mat, as a bit of a surprise when the flap's open. I used the front pattern from this gorgeous Owl Tag Blanket (which I will also be making at some stage...Hannah loves tags). I think it looks OK, and made the whole thing a bit more fun. Now, gotta put the sewing machine away this week, 'cause it's my Dad's 60th next weekend, and I'm in charge of the cake ... hmmm ... I feel a cake post coming on some time soon! Sis..can i order this from you? Have you considered iron on vinyl on the inside for a wipeable surgface? I think that would work great. With this one, I made sure it was all machine-washable, because I didn't want it to be too bulky, but if you don't mind a bit of extra bulk, the vinyl would work great! I made something (drum-roll) ... FOR A BOY! !